This all started in Chiu Dai park, Hong Kong, twelve years ago. The first mission of the first Hitman game. You’re given a target, a pistol and a disassembled sniper rifle in a briefcase. And something is odd. You’re just a guy, in a street. No one’s shooting at you. No one’s hunting for you. The challenge isn’t to survive, or to get to the exit, or to solve a puzzle. You can just explore, observe, and understand this space, then decide how to make one man dead. For the rest of that game, and for two others, the Hitman series kept giving us glimpses of that perfect assassination sim. And it kept screwing it up. The first game had you sprinting through a jungle warzone to steal a sacred tribal statue. Silent Assassin made you trek across fields of snow in Japan. Contracts hounded you with SWAT teams. And last year’s Absolution missed the point more completely than ever: it’s a story driven sneak-’em-up primarily about reaching the door to the next cut scene. But one time, in 2006, IO Interactive did make a near-perfect assassination sim. And it wasn’t just the best Hitman game, it’s one of the richest, most open-ended and enduringly satisfying games ever. 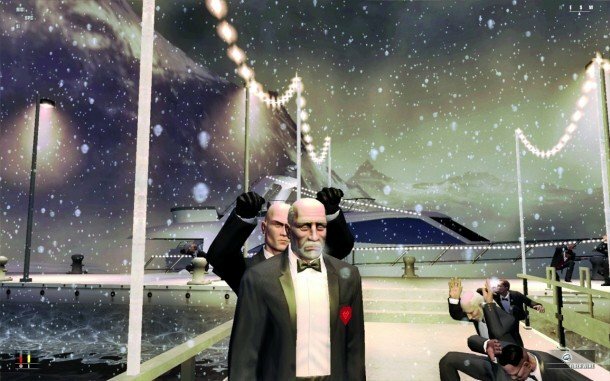 Hitman: Blood Money is the darker twin of Deus Ex. There’s a short, restrictive tutorial that isn’t very good. And there’s an ending so odd that many players don’t even realise it’s playable, and simply quit. But that’s it: every single one of the 12 main missions is a proper assassination in a space you can explore, with dozens of possible approaches. A Hitman mission – a good one – is a clockwork dollhouse of interacting elements. Guards walk their patrols on one timer, a short one, and it’s easy to learn and predict them. Workers have more elaborate routines: the dustman comes to collect the trash, the courier delivers the diamonds, the janitor uses the bathroom. And the centrepieces, the targets, all move differently. One performs a whole opera rehearsal before retiring to his dressing room. One takes a long soak in a glass bottomed jacuzzi. One performs a pyrotechnics show. You can weave between these moving parts to put the tiniest spanner in the works, and watch it all fall apart. Replace a prop pistol with a real one. Crack the glass jacuzzi with a silent shot. Rig a flamethrower to catch the performer mid-act. Each orchestrated accident is the solution to an elaborate puzzle, whose clues are everywhere if you look hard enough. But minimal intervention is just one extremity of a huge possibility space, one that includes a world of other stylistic philosophies to kill by. I’ve tried killing everyone with a kitchen knife. I’ve tried never changing out of my suit. I’ve tried using only an unconcealable shotgun. And I’ve tried the Silent Assassin code: no witnesses, no evidence, and no kills except your target. My current favourite is similar, but stricter still: every target has to be shot with my custom sniper rifle. It’s a long range and silent weapon, but because it’s so big I have to unpack it from a briefcase and assemble it before each shot. On missions with three targets, that means unpacking and repacking the weapon three times, in line of sight of each target, without being spotted. It’s hard, which is why I’m doing it. But it’s possible, which is crazy. Every time I think it can’t be done, Blood Money’s mission design surprises me again. There’s no way to get an angle on Manuel Delgado while he’s out in the open, but it turns out there’s a row of barrels in his wine cellar that can hide my set-up and pack-away rituals. There’s no way to assemble my gun in a gang boss’s office before he turns around, but it turns out there’s a drainpipe across the street I can climb for a perfect angle on his balcony. And there’s no way to take my briefcase with me into a rehab clinic, but I can toss it over the wall, wait for the guards to confiscate it, then steal it back from their security office once I’m inside. 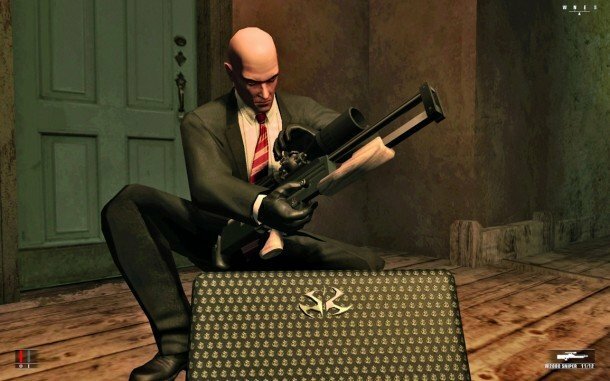 In fact, if you’ve ever wondered what’s so special about Blood Money’s level of simulation, throw a briefcase into it and watch what happens. You’ll find them on most missions – full of money, diamonds, DNA samples, or just hotel guests’ luggage – and they open up an extraordinary set of deceptive schemes. Luggage is not suspicious when you’re carrying it, which means you can sneak bombs or guns into it to get past a full body search. But unattended luggage is odd, and will be picked up by the nearest guard. If there’s a bomb in it, you’ve just given yourself a way to remotely and instantly kill everyone in the security office at any time. If there’s a gun in it, as in my sniper rifle example, you can steal it back once you’re past security yourself. But Blood Money lets you be trickier still. What if there’s nothing in the briefcase? It’s still an odd thing to find lying around, and a guard will still pick it up and take it away. But now the endgame is not what you’re interested in – it doesn’t matter where the briefcase ends up, but it matters that one of the guards has to take it there. Particularly when there are only two patrolling the objective. 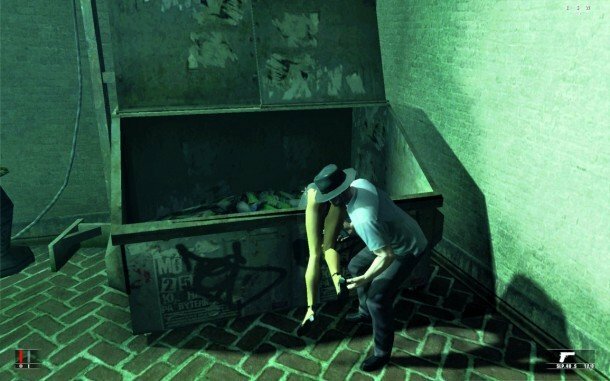 As one walks off with the briefcase, his partner can be silently strangled, his uniform taken, and his body hidden before anyone else even knows you’re there. And when the other guard gets to the security office, he sets down the empty case and turns to see a colleague he doesn’t recognise. The colleague’s gun has a silencer on it. And that’s the last line of code that passes through his digital brain. Hitman is a murder simulator, and that might be a terrible thing. I don’t know. But if you’re going to make one, make it as beautiful as Blood Money. Make it a dark and complex work of interactive art, a working model of the mathematics of lies. Six years later, people like me will still be too enthralled with playing it to care. Next articlePassport expiry dates and blank pages: what are the rules?